Mark our words: this one’s gonna be good. We now have the full label — see below! The Modern Protein Ingredients for chocolate (left) and vanilla (right) – ALL isolates! So right off the bat, we know that this won’t be the cheapest protein, and that’s fine because it’s high quality. The good news is that it will be great for anyone who’s lactose sensitive – this shouldn’t give you any gas or bloating. Note that there is some whey protein concentrate, though, so if you’re completely lactose intolerant, there may be some risk in using it. Note that milk protein isolate contains 80% casein protein, and will bring some thickness to the party, which is great — there’s only one thickening agent here (guar gum), and it’s pretty low on the label. We’re fans of proteins that find ways to not need too many thickening agents / fillers. Need more details on these specific ingredients? Keep reading..
5 No Amino Acid Spiking! 6 What about the flavors? Let’s go into the details of each ingredient. 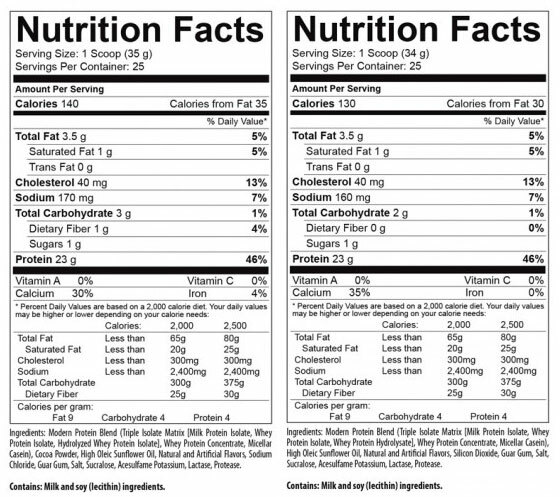 Though the overall protein count in grams is the same between flavors, the actual composition of the “Modern Protein Blend” appears to vary a little bit, at least according to the label. Both chocolate and vanilla appear to have the same amount of milk protein isolate and whey protein isolate, which are the leading sources of protein. Chocolate lists “hydrolyzed whey protein isolate” as its third-greatest source of protein, however, while vanilla lists “whey protein hydrolysate” in this position. Both flavors list whey protein concentrate and micellar casein as the remaining protein sources. So what’s the difference? Is there one? If you read carefully, though, you’ll notice that chocolate is using an isolate, while vanilla is listing regular whey protein. Our best guess is that this is just a flavor or texture thing, and doesn’t really affect the amount of aminos you’re getting in any significant way. So the differences likely won’t affect anyone, but it’s something to note, in case you want more isolate. But what about all these other proteins flying around? They all come from milk, but there’s subtle differences. Milk protein isolate is a concentrated protein product that comes from skim milk. The proteins are in the same ratio as they are in regular milk. It’s also very low in lactose. 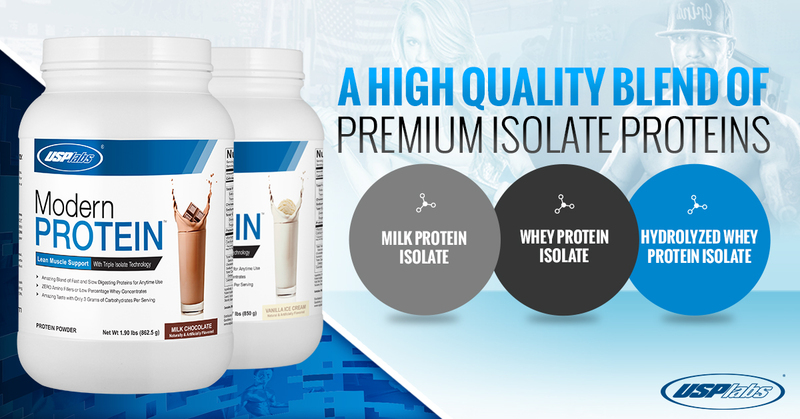 Whey protein isolate is simply whey protein that has been processed to remove all the lactose and fat. Whey protein concentrate, as the name suggests, is just concentrated whey protein. It’s low in fat and lactose, but not completely free of it. Micellar casein comes from milk just as whey does, but it’s a different substance. Casein takes longer to be digested, and micellar is considered the premium form of casein. When they talk about “curds and whey”, the curds are the casein part. The slower-digesting, thicker part often used to make cheese. Basically, this is a mix of fast-digesting proteins for immediate use (the whey products) and slow-digesting proteins to continue providing aminos during the recovery period (the milk protein isolate and micellar casein). Normally, we wouldn’t cover guar gum as it’s just a standard thickening agent. But it’s noteworthy here as it’s the only standard thickening agent in the mix! The thickening seems to be mostly naturally provided by the milk protein isolate, which is probably why it’s the #1 protein source on the label. Sucralose is your zero calorie sweetener of choice here. It’s been shown to be very safe, but as with all sugar-free sweeteners, some people have uncomfortable individualized digestive reactions to them. At this point, you’ve likely tried it – it’s the main sweetener in Splenda. But if you’ve never tried it before, it’s best to grab a packet somewhere and mix it into a drink first to see if you have any kind of reaction to it. USPLabs is also claiming to have no amino acid spiking. This is nothing new for them — If you remember from the original OxyELITE Protein launch campaign, USPLabs marketed against amino acid spiking before it was the cool thing to do. In fact, we could say that they were too far ahead of the curve there, because most customers simply didn’t know what they were talking about. With the help of the community, that is quickly changing. You can read more about this on our article titled Is Your Protein Really PROTEIN? 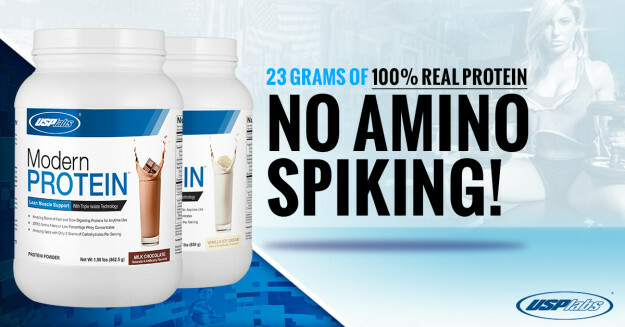 The Amino Acid Spiking Scam. 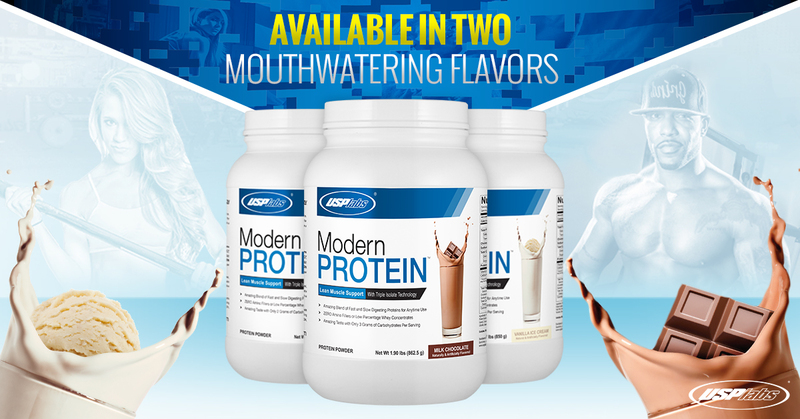 Modern Protein will start with the standard chocolate and vanilla flavors. This might not sound special, but we were huge fans of the vanilla flavor from OxyELITE Protein. It was strong, flavorful, and the powder was interestingly “whiter” than most powders too (not that color matters, but it was just different). For whatever reason, it went incredibly well in oatmeal too. So our hope is that USPLabs kept the vanilla flavor system, because it was on – if it is, this will easily find its way on to our Best Protein Powder buyer’s guide. The initial launch will start with chocolate and vanilla. We absolutely loved the vanilla flavor of OxyELITE Protein, and are hoping they kept the flavor system exactly the same! No Comments | Posted in New Products, Supplement News | Tagged Milk Protein Isolate, Protein Powder, USPLabs, Whey Protein Hydrolysate, Whey Protein Isolate.